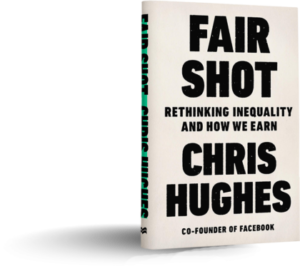 Facebook and Economic Security Project (ESP) co-founder, Chris Hughes has a new book out. Called Fair Shot: Rethinking Inequality and How We Earn, the book is part memoir, part policy proposal. The memoir chronicles Hughes’ childhood growing up in a North Carolina working class family, his school days, including four years at Harvard, his co-founding of Facebook, his failure as owner of the New Republic, and his efforts trying to figure out how best to give away his new-found fortune. The things Hughes learned during this thirty-year journey led to the policy proposal part of the book. Hughes advocates what he calls a guaranteed income (GI) and is clear about how his proposal differs from a universal basic income (UBI). A UBI would periodically provide everyone with a certain amount of money without any means-test or work requirement. Hughes’ guaranteed income proposal has two provisions which distinguish it from a UBI: it is means-tested and it does have a work requirement. His idea is that we should provide every adult living in a household with an income of less than $50,000 a year a guaranteed income of $500 per month. So if Tara and Willow were a couple with a household income of $45,000 per year, each would each receive $500 per month. Thus, each would end up with $6,000 per year or $12,000 per year for the two of them. If Buffy and Angel had a household income of $60,000 per year, they would be ineligible for the program. One reason Hughes is so interested in distinguishing his proposal from UBI is that he believes UBI has become too associated with automation. That is, the most frequently heard argument for UBI is that as robots and automation destroy jobs, we will need to reorganize society so people will be able to get their needs meet without having to sell their labor. Hughes rightly points out that there is a fair degree of debate about the extent to which jobs will be destroyed and, therefore, the extent to which concern about automation is a compelling enough reason to advocate UBI. Hughes also rightly reminds us that whether or not automation will destroy all, most, or whatever number of jobs; the job market is already unstable enough for there to be a need now for a policy which promotes economic security. And he believes his GI proposal is that policy. As an “old timer” in the basic income “movement” I feel obligated to point out that UBI was discussed long before folks in Silicon Valley were paying attention. And many of those discussions had little to do with robots or automation. Thus a name change, from UBI to GI, is not necessary to suggest there may be reasons to support UBI other than worries about robots taking our jobs. But here we get to the crux of the matter: Hughes’ proposal does not appear to be just a name change but a different policy altogether. As I said above, GI would not be universal and would not be granted to those who are not working. The means–tested nature of GI is clear: those in households with incomes under $50,000 per year would get it, while those in households with higher incomes would not. I’m not a fan of this aspect of Hughes’ proposal, but, for the purposes of this essay, I’m going to set this aside. The work conditioned nature of Hughes’ proposal is less clear. This is what I want to focus on in the rest of the essay. Even though Hughes’ GI would require people to work in order to receive it, however it does not have to be wage-work. That is, Hughes is willing to expand the definition of “work” to include care work, such as uncompensated child and elder care, as well as studying for a formal degree or training programs. So someone caring for their child or studying for a B.A. would be considered a worker and, therefore, eligible for the benefit, as long as their income was under $50,000 per year. Hughes places such emphasis on work because he believes it is good for us; he tells us that it makes us, “happier, healthier, and more fulfilled” (p. 103). To support his claim, Hughes refers to studies which show that unemployed people suffer higher levels of depression, irritability, and insomnia. He also informs us that unemployed people are more prone to alcohol and substance abuse. As I was reading this discussion of the problems faced by the unemployed, I found myself wondering how much stem from an inability to find something fulfilling to do and how much from stigma. I do not think it is unfair to say that our society denigrates people whom we think can work but choose not to. If you’re unemployed and wondering whether people think you’re legitimately out of a job or are simply a free loading slacker, it should not be surprising if you end up feeling irritable or depressed. But let’s say Hughes is right and people do feel more fulfilled if they engage in wage work. Let’s say that engaging in wage work makes us less prone to depression, irritability, and insomnia. Going to college or caring for one’s kids is not wage work. So what do studies showing we are less prone to psychological and physical problems when we engage in wage work have to do with the kinds of non-wage work Hughes wants to compensate with his GI? I suspect it’s fulfilling, at least some of the time, to take care of one’s kids or to attend college. Is this why care takers and students, along with wage workers, should be compensated with a GI? But if something being fulfilling is sufficient to warrant compensation, why stop at wage work, care work, or going to school? People do all kinds of things, besides these three, they find fulfilling. Why not give them a GI too? On page 92 of his book, Hughes says that, “everyone who contributes to their community” should receive a GI. It seems that engaging in something fulfilling is not what warrants receipt of a GI — making some social contribution does. This raises the question of whether being a wage worker, care taker, or student are the only ways to contribute to one’s community. Hughes’ answer seems to be “no.” On page 112, he argues for a more expansive definition of “work” which would include not just wage work, care work, and studying but also community service, religious service, and artistic work. Here I found myself wondering how far Hughes is willing to go. That is, how expansive a definition of “work” does he want? The more expansive his definition becomes, the more fuzzy the distinction between GI and UBI (the unconditional part) becomes. To see what I’m getting at consider the following example. In downtown Manhattan, there’s a famous, at least among many basketball lovers, outdoor basketball court on 4th Street and 6th Avenue. Basketball, in a sense, is a very communal game. A person may shoot jump shots all by themselves. But to play a full court pick-up game requires ten people. So if someone decides to play, even for the “selfish” reason that they get fulfillment from it, they benefit the other nine players as well, simply by making the game possible. Now the folks who play at this Manhattan court are quite good. Many of us who’ve seen games at this court think it’s some of the best pick-up basketball we have ever witnessed. In fact, the quality of games at this court is so high, that large crowds of people usually gather just to watch the action. Presumably, these spectators get a great deal of enjoyment from watching these folks try to get the “ball in the hole.” Now here’s the question: are the players at this court, simply by playing, making a social contribution? They are not doing wage work, care work, art work, or religious service. Are they doing community work? If Hughes’ GI were enacted and all these players were from households with incomes of less than $50,000 per year, should they receive it? In a society where work is a fundamental value it may be necessary to call something work, as well as convince others that it is, in order to give the person engaged in that activity a guaranteed income. This is a response I would agree with. But I would add that the importance of semantics cuts both ways. Requiring an activity to be considered work before the person engaged in it can receive income support is also sending the semantic, or symbolic, message that only working people deserve economic security. I can understand why we might want to do this in a hunter-gatherer society where all are living on the brink of starvation. But do we really need to in the richest society the world has even known? Consider something that may at first appear unrelated. The U.S. currently imprisons about 1.5 million people. Anyone familiar with the U.S criminal justice system is aware that our prison population is, arguably, one of the most despised groups of people in the nation. Yet we grant all these prisoners a right to food. Prison life is no doubt hard. And we certainly do not feed incarcerated people the best food possible. But we do feed them, and I suspect anyone who proposed that we stop doing so would not get very far. Now here’s a question: is refusing to make a social contribution worse than the most serious violent crimes we have imprisoned some people for committing? If not, why propose a policy which sends the semantic message that non-working people do not deserve income support, income that could help them obtain food, as well as meet other basic needs? Why send a semantic message which implicitly amounts to the claim that non-working people are worse than some of our most violent prisoners? To anticipate a possible misunderstanding, I am not claiming that non-working people are better than some of our most violent prisoners. My point is simply that if all prisoners have a right to subsistence, why not grant non-working people that same right? Prisoners, non-working people, and all the rest of us are human beings in need of food and other means of subsistence. A UBI, at the semantic level at which I am speaking, acknowledges this. Hughes’ GI proposal does not. Thanks to Chris Hughes for his very helpful comments on this piece. Any mistakes or errors are, of course, my responsibility alone.